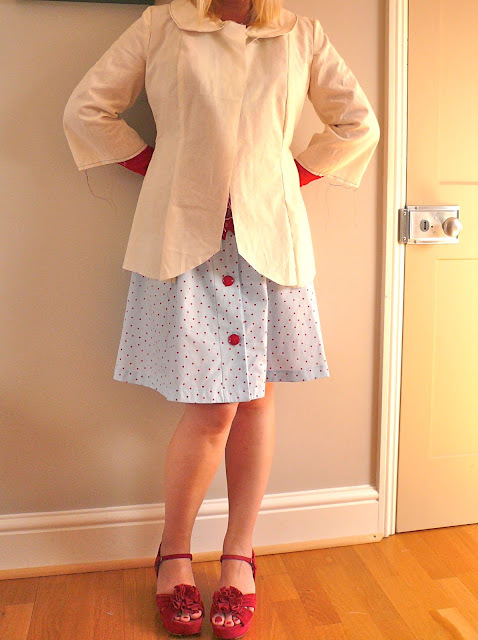 Handmade Jane: Making a start on the Abbey coat - and a giveaway! Woo - I'm so excited to see this! I've been loving the pattern for ages, but haven't seen any made up yet. The fit looks great on you so far. I have a similar problem with my machine and buttonholes, so maybe bound buttonholes will be better (even if more challenging in their own way!). Whichever you go for, good luck! Thanks to you and The Village Haberdashery for the giveaway - exciting! I've signed up for the newsletter - I hadn't spotted it at the bottom of their page before, so thanks for bringing it to my attention! Wow! Thanks for the giveaway! I've been eyeing this pattern for a little while, the muslin looks great on you so hopefully I'll win and get to have a go myself! Thanks! thanks for the giveaway, though being as how I've not finished the current coat I'm working on I probably shouldn't enter. the only thing that's stopping me finishing is the button holes. I planned to do them on my machine but it didn't like the fabric and id left it too late for bound button holes. the end result is I'm making hand worked button holes which look good but are a lot of work! Love this coat! And such pretty fabric picked out! I would be super excited to win this giveaway! If I don't win I think that I would totally buy it anyway! my email is nicoleatobin (at) gmail (dot) com. Make bound buttonholes. They are really not as hard as they look. I like to make triangular bound button holes. I think they are easier than the normal ones and they add such a special, unique touch. You are so good - a muslin, eh?! Very sensible! It looks like a good fit and I love your fabric choices. I have put my coat project away for a couple of days to gather my energies - it is definitely not something to rush into! Such a gorgeous choice of fabric and lining and the pattern is perfect for you Jane - think this will be divine! Ooh buttonholes - another nemesis of mine. I'd say go for the bound buttonholes as per Karen's coat - they were stunning and I know only too well how scary doing buttonholes on the machine is, especially when it's the last thing to do - STRESS! Looking forward to seeing the finished make. It'll be so nice and meditative to take your time without rushing and the perfect way to look forward to autumn/winter! love the fabric and lining - polka dots are my favourite! This is going to be fabulous, I can feel it in my bones. Your fabric is gorgeous, and your muslin fits beautifully. Good luck with it! Even though I am light years away from making a coat, I really love this pattern, and winning it may be the push I need to work on some tops. Thank you for the chance, my email is ozzyblackbeard (at) gmail (dot) com. ps - I love your style! Well the muslin looks fab so can't wait to see the finished item! That polka dot lining is just divine. Thanks for a super giveaway...I would love to give this coat a go! Ah, I've recently bought a pattern for a rain mac myself, and I keep putting it off despite having bought some beautiful fabric for it. I must give it a try though. I would love to be entered into the competition. Ooo, gorgeous! I love the collar and the flare at the hem - such a simple yet utterly fab style. I already decided that I'll be doing bound buttonholes on my next coat - they look so professional and I just can't make my 1970 Pfaff sew a nice buttonhole (sorry, Sweetheart, you didn't hear me say that). I signed up for the Village Haberdashery and I'm glad to know about them, too! Can't wait to see how the coat progresses and thanks for reminding me even though it is still hot as an oven where I live in the US, those colder days are coming . . .
What a gorgeous feminine coat. I can understand your buttonholing woes, I've just made a muslin of Sewaholic Thurlows which included the most woeful welt pocket in history. I'll definitely be practicing on the same fabric (at great length I suspect) before doing the 'real deal' in my Thurlows. I've also subscribed to the newsletter - I love this coat, my coat collection is very severe and masculine. Save me! Best of luck with your project! I can't wait to see the final results. I think the fact that the muslin fitted perfectly is a very good omen, the finished coat is going to look wonderful. I did make a coat once, a much simpler version than yours though, it was a wrap over, so no buttonholes to contend with! 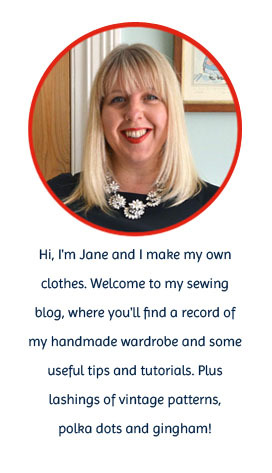 And thanks for the link to Vintage Haberdashery, at last I know where to buy all those wonderful patterns I've only read about in blogs, have signed up! The muslin looks really good on you. I can't wait to see the finished coat. You picked beautiful fabrics to showcase this lovely coat. Not to mention those shoes!! They are to die for --- I want them!!!! As to the pattern giveaway, who wouldn't want to make it! You are so sweet to offer such a nice gift. I'd love to make a new coat. Can't wait to hear how this progresses! I've had my eye on this pattern for a while but haven't plucked up courage yet to try it as it would be my first coat. I LOVE your fabric choices...perhaps this will be the impetus I need to add a coat to my project list. I would love a chance to win this pattern - I've had my eye on it for some time. I look forward to seeing yours made up. OOOH - I'm in. I failed miserably at my coat effort this winter. I'm going to blame the pattern, not the maker. Maybe this one will be a winner. I made my first coat a few months ago & decided to go with bound buttonholes. From memory, it took me a whole afternoon to do 5 of them, but am so glad that I did. Finding bound buttonholes on RTW garments is pretty uncommon but they're such a lovely detail. I think the extra effort that you put into a handmade garment makes it all the more special (even if it may me a major headache at the time :p ) Also, have you considered taking them to be done on a professional buttonhole machine? I can't give you any leads on where to go since I don't live in London, but you shouldn't have any trouble finding somewhere. Looking forward to seeing the finished masterpiece! I have been eyeing this one, and yours is going to be lovely! I'd love to win! This would be my first attempt at a coat as I'm quite a newbie sewer, but I'd love to have a go- it's such a gorgeous shape. I really love your fabric choices. I can't wait to see the finished result. Thank you for the chance to win this great coat pattern. I have been eying it off myself since you first mentioned it on your blog. Good luck with your make. I am looking forward to seeing it made up in that lovely wool. Oh, I've always liked that pattern. Can't wait to see you finish it! I love this coat pattern! The other day I was looking at it and I thought, "This is most definitely something that HandmadeJane would make!" What a coincidence. I am in the process of making TWO coats. Both of which are kind of terrifying me. I am also having a dilemma with buttonholes. My green coat is of a super thick cashmere wool blend. It's almost 2mm thick and thankfully doesn't fray. Not sure if that is TOO thick for making bound buttonholes. My other option is to hand work them. Which will require great practice. The other coat is a burgundy trench out of much thinner fabric. I could make bound buttonholes for these but there is quite a few of them and some mock buttonholes too which might look weird with the bound ones. Decisions! Good work so far! Cant wait to see the final coat. Would be a big step to make a coat, but would love to try some day! Wow, thanks for the giveaway! Can't wait to see your finished coat, that wool is just gorgeous! I'd go with bound buttonholes (not that I've ever done them myself), because you're going to so much effort over the coat itse;f, that it would be a shame to have to unpick buttons ebcause the fabric is so thick. Bound buttonholes will make it look so much more tailored! I think Gertie had a pretty good bound buttonhole tutorial on her blog somewhere. Looking great Jane...I guess I need to start thinking about mine soon too if I want to wear it this winter!!! I think you have much more control with bound button holes. You're not relying on a manically whizzing sewing machine needle to not go off course. Slower and more controlled - happy days. Don't enter me for the giveaway - there's a limit to how many coats I am willing to make two winters in a row!!!! The patterns is lovely and the fabric gorgeous! Such a beautiful pattern! I love the polka dot lining, too. I just signed up for the village haberdashery newsletter. Looks like a great shop. Don't enter me for the giveaway Jane, I'm too lazy to make a coat (Colette Ceylon has been sitting in my stash for, like, two years) but I wanted to say I LOVE your fabric choice and also your shoes! love that patterns and your farbic choices! i would love to try and coat so even if i don't win, thanks for bringing this pattern to my noitce as it's lovely! are you doing with flounce or without? oh dear. apologies for the typos above. not sure what is up with me today! What a wonderful pattern. I have never made a coat, but my Mum always made our as kids, so I'd love to give it a go, and that petrol blue is an inspired colour choice! Love your color choices! I've never made a coat, but I'd love to give it a try as the only coat I have now is very, very ugly multi-colored leather jacket from 1992. :D Thanks for the giveaway! Looks fun. Great fabric choices! What an inspiration you are! The coat is going to be lovely irregardless of which buttonhole options you choose :). Ohhh, I love this pattern! It's been on my wishlist since I first discovered it last year :) Fair warning - once you make a coat, you will want to make a new one every year. It's addicting! I love the pattern although it looks quite advanced - but I would love to have a go at it one day. The shaping at the bottom is just so pretty. Can't wait to see your finished article! What a lovely pattern! I also just subscribed to the newsletter! Thanks for the giveaway! This is such a cute coat! Please pick me! I have been eyeing up this coat for a little while now, and would love the chance to have my very own. Count me in!! I LOVE this coat! I loved it the minute I saw it. Please count me in. I subscribe to the Village Haberdashery newsletter. I love this pattern. It's a stunning coat. I am already as subscriber to the newsletter. Oh, I this pattern is so cute - and how much I would love to win it!! Your muslin looks very good already, I bet the finished coat will just look lovely. My suggestion for the buttonholes: try both versions (on scrap fabric, of course) and see what works better for you. This is such a cute coat pattern! I love it! I need it! I also signed up for the Village Haberdashery newsletter. Thanks for hosting a great giveaway! Fabulous coat! I have the perfect fabric waiting for this! I already subscribe to the Village Haberdashery newsletter! Hi Jane, please count me in! This pattern is so nice. I am already a subscriber to the Village Haberdashery Newsletter. I love the pattern! I'm going to New York in their coldest month so this coat would be PERFECT for it! I love that jacket pattern so much! And I am very excited to watch your sewing progress for your Abbey. I love that pattern and the fabric you chose is absolutely lovely! I am eager to see your finished jacket. wow what a gorgeous coat pattern - I haven't made a coat for over 10 years - so must be time for me to try again!!! What a gorgeous pattern, I'd love the chance to win it. I'm very excited to see your finished coat. Great fabric choices! I have been wanting to make a coat for a while now and love the look of this pattern so would love to be entered into the draw! That toile looks a splendid fit, and I'm keen to see how the finished garment looks. Thanks for the giveaway, I'd quite like to have a go at this as a coat. I love that color! I'm sure you will do a great job, I know what you talk about when you talk about buttonholes, that happen to me also. I recently bought some black/white polka dot wool blend fabric from ebay and have been on the look out for the perfect pattern. I think I might have found it! The coat is going to look great! Thank you for the give-away. I love the pattern and your choice of fabric too, the lining is really going to look great. Testing out the buttonholes sounds like a good idea. Looks like an amazing coat! Love the polka dot lining! OMG! I stummbled across your blog last evening and couldn't stop looking. I read through as many posts as possible last night and I am up for more this morning. LOVE your blog! I just can't seem to stop reading. You have done such a great job on all your outfits and they look perfect on you. Thanks for sharing such fun! The muslin looks great!I love your fabric and spotty lining! Can't give any advice about buttonholes, but I look forward to seeing what you decide! 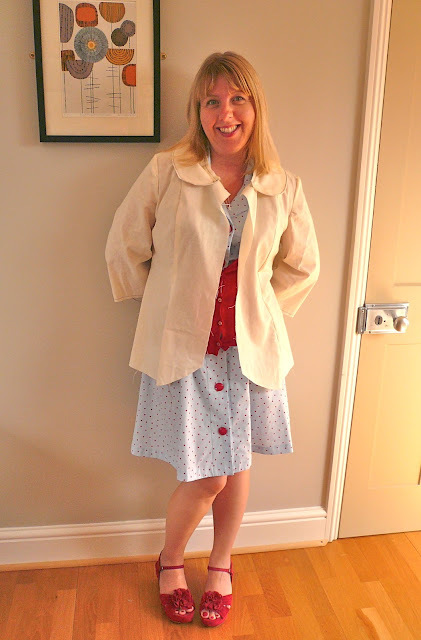 I've subscribed to the Village Haberdashery newsletter-they have a great range of patterns.